Hello everyone and thank you for stopping by our website and wanting to know a more about us. 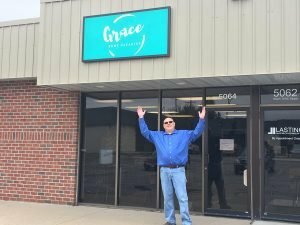 I am Kevin Smith, and I am the founder of Grace Home Cleaning. I have been married for Twenty-five years to the love of my life Mary. Together we have four children that have brought great blessings to our lives, Melissa, Emily, Erica, and Christopher. With having four children cleanliness and finding the time to get dinner and housework completed was always a chore and usually ended up being either late night or that rainy day when all of the kid’s sports were canceled. I served in the United States Army National Guard which began my cleaning career. I served a combined ten years service in the Nebraska and Kansas Army National Guard. While in the National Guard I attended college at DeVry in Kansas City and I earned my Bachelors in Electronic Engineering Technology. After college I worked in the high tech industry as a field service engineer, being in this industry, they moved our family all over the Western part of the United States for thirteen years. Our longest stay in one city was ten years in Colorado Springs, CO. Another perk being a field service engineer was the ability to travel all of the time, so during those travels, Mary would have the joy of managing the house and all of the kid’s school, sports and best of all making sure the house was running like a well-oiled machine. As you can see, I am very sarcastic with this statement, but it put stress on our family like a lot of other families. After being downsized, we moved our family back home to Omaha, and I was able to get into the energy production industry at the nuclear power plant just north of Omaha, NE. After nine years of working in various departments for the energy company, the powers at be decided to close our plant due to economic reasons. After hearing countless friends going through the same issues that Mary and I went through raising our kids with never having enough time to do all the things that needed to be done. I turned his focus to help families manage their time by establishing the BEST Home Cleaning Service bar none then any other company. Plus, every industry that I worked cleanliness was a must! And almost all of the time it was procedure driven. So with that Grace Home Cleaning was born and I have not looked back.